All La Canada Flintridge homes currently listed for sale in La Canada Flintridge as of 04/20/2019 are shown below. You can change the search criteria at any time by pressing the 'Change Search' button below. If you have any questions or you would like more information about any La Canada Flintridge homes for sale or other La Canada Flintridge real estate, please contact us and one of our knowledgeable La Canada Flintridge REALTORS® would be pleased to assist you. "This Once in a Lifetime Flintridge Estate features every amenity possible! This magnificent home is a unique blend of Spanish Colonial Revival & Art Deco architecture. The design, a collaborative design by L.G. Sherer, principal of the building firm & Pasadena architect, Cyril Bennett, was built by L.G. Sherer, and completed in 1929. The home of over 13,000 square feet, has been meticulously redesigned and remodeled extensively by both the previous & current Owners. There are two APN's totaling approx. 1.18 acres of meticulous landscaping, including numerous outdoor water features, fountains, koi pond, pool, spa, lanai, views & entertainment areas. This unparalleled home is ready for the discriminating purchaser desiring a property ready for entertaining. Between '99 and 2003, a total renovation and expansion was done, including an approximately 5000 sf addition comprised of the master bedroom, family room, pub, theatre, gym, sauna, bath & lanai. Current Owners ('06 to present) have taken the property to yet another level! They have done extensive remodeling, including the gourmet kitchen with custom cabinetry & reproduction Batchelder tile (2010) & the most spectacular Master Bath/dressing area (2018) w/ custom designed tile, THG fixtures & onyx counters. Completely remodeled pool/spa w/custom painted tile (2017). TOO many amenities to list: Lovely attached one bedroom guest apartment w/separate entry, Savant system, Lutron system, 4 car detached garage with motor court." "This tucked away, hidden treasure magnificent estate sits on approx. 3.6 acres and is surrounded by an extensive lawn, winding trails, tranquil sitting areas, full of mature trees, and rock/cactus. Over 3mm spend on the property improvements. The main residence offers 7 bedrooms and 9.5 baths. (7-bedroom suites upstairs 3 master and 4 junior w/ ensuites). The main house also features two kitchens, one downstairs and one upstairs. The foyer opens to a spacious living room featuring an elegant fireplace. The charming sunroom opens onto a patio & gardens. The kitchens have built-in high-end appliances. There s a large formal dining room w/fireplace. The lower level features wine cellar& 4 car tandem garage. The rooftop deck, many of the rooms and patio areas offers exceptional, breathtaking views of the mountains, downtown L.A.& Catalina Island. The property features a pool, guest house w/ 3 bed 2 baths, kitchen, Fireplace, and 2 car garage. The backyard also offers a kitchen w/ pizza oven, two grill areas, two separate sitting areas with a fireplace. This property has plenty of areas to add a tennis court!" "A stunning English Tudor estate in the heart of La Canada Flintridge! Its unique charm of the British aristocracy temperament makes you feel both noble and dignified. The elegant, pastoral, and poetic spirit of the residence is also revealed. Magnificent and premier location. Expansive, private manicured gardens, sparkling pool & spa, fruit trees, patio, vast lawns, and well-defined rose garden. Entering the main house foyer, you will see the formal living room, grand wooden staircase and formal dining room. Comfortable family room and gourmet kitchen. The tremendous eat-in kitchen is certain to be the home's central gathering space with its easy access to the expansive dining room and the outdoor dining pavilion with fireplace. There are 5 bedrooms and 4 baths on the second floor. The master suite features a beautiful remodeled en-suite bath and spacious master closet. The Guest House features 2 bedrooms, 1 bathroom and a kitchen. The 6-car garage also has a private office above it. A sauna and bath are adjacent to the pool area.The fully fenced-in lot and iron gates provide more privacy. Don't miss this fabulous and extremely rare chance to own this exceptional property! Award-winning La Canada Schools." "This unique and artistically conceived estate was designed and built by noted industrial designer Kohei Eguchi in 1995 as his personal residence and is a work of modern art. The home's magnificent architecture evokes feelings of space and light, bringing the outside in. Reminiscent of Frank Lloyd Wright, the clean lines and large spaces help enhance the magical environment of this home's setting. The private gate and expansive front lawn usher you to the dramatic entry which leads to the heart of the home - a two-story formal living room with massive windows that frame the property's mature oak trees. The main portion of the residence has 5 suites, a family/media room, formal dining room and living room, kitchen and an additional family room on the second floor, originally used as the presentation room for Eguchi's Design Studios and conceived to be the master suite. A separate but integrated guest quarters has three additional suites. The 3-car garage, plenty of parking, and separate workshop complete the estate. On 1.1 acres of land, 2 lawns provide plenty of room for a pool. Experience a true feeling of escape in the oasis of this forest-like setting with a stream, tea room and several patios to take in the beauty of the location. Not to be missed!" 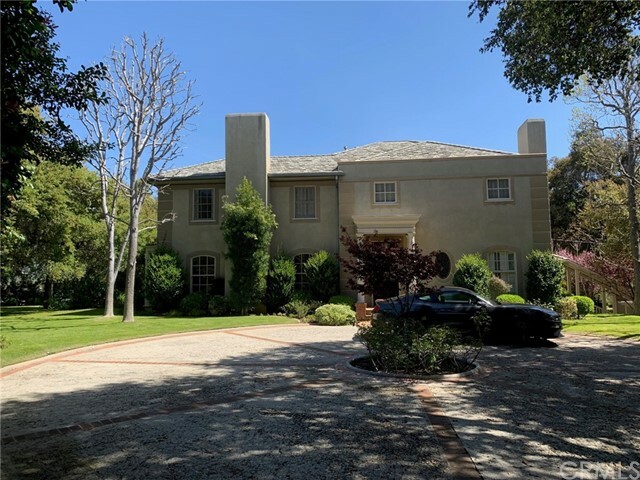 "Situated on a flat 61,433 square foot( 1.41 Acres)double lots in the prestigious estate area of La Canada Flintridge, bordering the Descanso Garden. The gated driveway leads to this beautiful home offers wonderful floor plan, Expansive foyer leads to the tastefully appointed high ceiling living room and the huge family room with dual fireplace and wet bar. Oak wood floor though out the living room, family room and dining room. Kitchen with granite counter top, wood cabinets, New build-in refrigerator, Breakfast nook has a fire place. There are 4 suite bedrooms, the master suite bed room has 1.800 square feet of luxury with two huge walking in closet and den. Fully-landscaped yard offering added privacy and tranquility, 47 Feet long swimming pool, spa, Koi pond, full size tennis court, 5 car garage. Exceptional La Canada Schools"
"Settle down in the one of the most sought after locations in La Ca ada Flintridge. 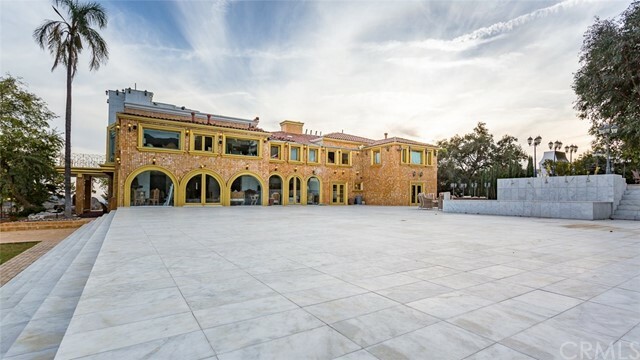 This beautiful Contemporary Mediterranean sits on nearly 1 acre of flat land, features a breathtaking grand double staircase as you walk through the front door into the foyer. This family dream home features five bedrooms, formal sitting and dining area, open master gourmet kitchen that flows seamlessly into an entertainer's rear yard. The spacious back yard includes a resort style pool with a waterfall and greenery, a lounge area with an outdoor fireplace all next to the chef's grilling island and counter. The lower level consists of a library and media room along with a bedroom setup for a maids quarters. Upstairs you will find the elegant master suite that features his and her bath and closet, a balcony to view the enchanting rear yard and another that overlooks the expansive motor cul de sac. A spacious yet homey house for family gatherings in the heart of La Ca ada Flintridge." "Situated on one of the most desirable streets above the La Canada Flintridge Country Club with breathtaking views of Downtown Los Angeles and beyond! The estate was completely redone in 2018 featuring 5 in-suites and plus a grand office. The gourmet kitchen has the highest quality appliances which was crafted to perfection. A grand family room opens out to a spectacular backyard with endless views and an amazing relaxing pool." "Architectural Masterpiece. La Canada walled & gated Modern on nearly 1/2 acre of flat, usable land. Soaring ceilings & massive walls of glass. Entertain in your private, expansive outdoor spaces w/mature tree coverage, grassy yard, swimmers pool & 10+ person hot tub! Tricked out cooks kitchen w/indoor-outdoor dining options. 1st floor master suite & 2nd floor private master retreat w/study-sitting room. Lower level media room-flex space. Oversized garage & up to 10 car gated parking. Exceptional quality & design. 1st Showings on Tuesday, 4/23 from 11-3pm." "Brand new construction, 2019 Cape Cod style home! This newly built 6-BR / 9 bath home situated on a 17,472 lot beautifully combines a bright contemporary floor plan with only the finest touches and detailed custom craftsmanship. Standing at 6,400+ square feet of luxurious living space. Located on a beautiful tree-lined street close to town, this home has everything you are seeking, including a beautiful state of the art gourmet Kitchen that opens to the Family Room, two fireplaces, and six en-suite bedrooms. Enjoy endless luxury as you flow through sliding glass doors from the family room to the beautiful back yard that includes an outdoor living area with fireplace, sparkling brand new pool & spa with large 8 person outdoor bar/kitchen, separate pool bath, and expansive grassy play area. The numerous upgraded systems include state-of-the-art home automation, built-in home audio, home security and wi-fi network. This home is elevator ready on all three levels, with an 8 chair movie theater ,and wine cellar. Attached 3 car garage with 11.5 ft height for vehicle lift. All of this and much more....in the highly accredited and renowned Blue Ribbon award-winning La Canada Unified School District." "Enter the gates to this beautiful and serene French Country Estate built in 1941 and renovated since, and enveloped by 1.32 acres of stunning gardens, pool, tennis court and breathtaking views. Adjacent to the house and over looking the pool is a separate guest house studio, with full kitchen and bath. The home boasts an elegant formal entry, a large living room with fireplace and surrounded by large windows overlooking the gardens and the views. The cozy library, with built-in bookshelves has a fireplace and a half bath. The large dining room with separate built-in bar looks over the courtyard and the mountains. The comfortable and large family room has a third fireplace and an entire wall of built-in bookshelves. A guest bedroom with full bath, a large laundry room and kitchen complete the first floor. On the second level are three master suites. The two largest ones have glorious views of the pool and the mountains beyond, one with romantic balcony and the other with a picture window along an entire wall. A newly remodeled master bath all in white marble and a huge walk-in closet complete this fabulous home. This is a must see home. Truly one of a kind. Please note that total square footage includes Main House: 4466 sq/ft and Guest House: 576 square feet." "Remarkable value for exquisite estate on a prestigious cul de sac with awe-inspiring views! Escape to a luxurious, custom built retreat with luxurious finishes, grand volume and expansive windows overlooking vistas from Downtown to the ocean & beyond. The gourmet chef's kitchen boasts stainless steel appliances, center island, vast storage, breakfast nook and more. Unwind in the decadent master suite with elegant cove ceiling, romantic balcony, fireplace and en suite bath with soaker tub, glass shower and dual vanities. . Additional features include elevator, sophisticated guest bedrooms, custom finishes, 4 car garage, lower level entertaining space with private theater, game room & bar, office with endless built-ins and multiple living spaces. Relish the resort-like yard with a sparkling pool, tranquil spa, multiple areas for lounging/al fresco dining & BBQ. Priced to sell, this mesmerizing estate could be yours!" 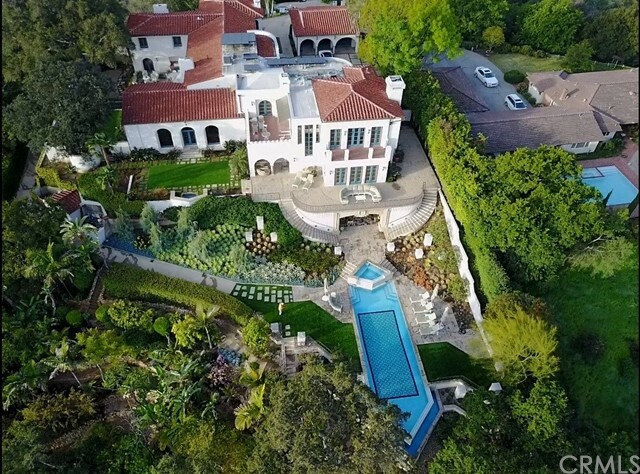 "First time on the market in over four decades, this timeless gated Flintridge estate is located in the heart of Flintridge, surrounded by multi-million dollar estates. Framed with gorgeous trees and a mountain backdrop, there is a lovely home, guest house, pool and spa. Direct access to the city's trail system is a bonus, and this property is equestrian zoned. Situated on a lot of 26,871 sq ft, the main and guest houses have total square footage of 6,107 (per Assessor, Buyer to verify). The main home offers 4 bedrooms, office with built ins, formal living room with fireplace, formal dining room, entertaining area including family room and oversize fireplace, den and centrally located custom hand crafted wet bar. The roomy kitchen offers a center island and breakfast area, wine rack, and fireplace and is located near the laundry room. The master suite has a fireplace, sitting area, two walk in closets, bath with separate tub and shower and views of the grounds and San Gabriel mountains. The guest house is equipped with kitchen, living room, two beds and bath. Other features include a gated circular driveway, wainscoting, wood paneling, crown moldings. gazebo, generator, three car garage, central air and security system. Award winning schools!" "Completely redone five bedrooms 4357 sqft. measured includes private studio and an office, open floor plan with panoramic views to downtown and La Canada Flintridge Country club, superb quality throughout with fantastic pool and waterfalls." "Built in 1931, this iconic French Norman Revival garners attention from first sight. Designed by Robert H. Ainsworth of Pasadena and build by The Cooper Brothers of La Canada Flint. The home sits prominently on a corner lot behind a field of lawn with a mature landscape in the exclusive Meadow Grove circle. Be welcomed through the manicured courtyard garden to the formal entry. Make your way to the step down grand living room, ''reception hall'' with a vaulted open beam ceiling featuring hand hewed beams and trusses, ornate wainscoting, grand fireplace with custom mantle and surround, hardwood peg and groove floors and leaded glass bay window. Light filled family room with views of the private patio and pool yard. Large formal dining room with easy access off kitchen. Breakfast nook, butler's pantry and service bar room with sink complete the entertaining space. 4 bedrooms upstairs including a master suite with sleeping porch, individual changing rooms/closets and access to two bathrooms. Additional suite on ground level. Guest bedrooms provide easy access to bathrooms and open hallway. Be swept away by the romance of this property's details as it is a true work of art." "This elegant gated Mediterranean Estate was originally built in 1926 and completely and tastefully renovated in 1999. This stunning home was designed for gracious grand scale entertaining and intimate informal gatherings. A circular driveway welcomes you to this five-bedroom, six bath main residence. Additionally there is a separate 700+ square foot, one-bedroom, one-bath Guesthouse. The expansive park like grounds includes a delightful private backyard perfect for al fresco entertaining with a refreshing pool/spa and built-in barbecue and bar area along with a spacious covered patio.The interior of the main Residence features a formal entry with a classic central hall floor plan which offers every amenity along with a sumptuous oversized kitchen with a center island, granite counter tops, double ovens and a breakfast area which opens to a family room with a custom built -in entertainment center and an inviting fireplace." "Gorgeous Mediterranean style compound estate was masterfully designed and built in 1991, and completely remodeled in 2009. It offers 7,026 sq. ft. of living space on private 30,571 sq. ft. lot. There are two beautiful gardens that create your own personal oasis and welcomes outdoor entertainment. One with a gorgeous swimming pool and the other with BBQ and a lighted fountain, each on a flat, lush, landscaped yard. The three-story home has six bedrooms, a library/office and a recreation room, with mountain and tree views from every window. The main floor features a grand entry, vaulted ceilings, hardwood flooring and views to the garden with the lighted fountain. Gourmet kitchen has top-of-the-line appliances and high-end marble countertops and marble wall accents. The master bath features a spa tub surrounded with tile, glass enclosed shower with dry sauna, and a large walk-in closet. The lower level is perfect for a screening room and looks out over the pool. Don t miss the opportunity to make this estate your dream home!" "Built in 1999, this 5,276 sq. ft. 2-story, traditional style home is located on a cul-de-sac in the Flintridge Hills. This home offers five bedrooms, seven baths, a library/office with built-in cabinets, a gourmet kitchen with granite countertops and walk-in pantry. In addition to the formal living room and formal dining room, you'll find a large family room and dining area off the kitchen with beautiful outdoor views. The backyard has a lovely pool, brick bar-b-que, koi pond and plenty of flat grassy yard. It is situated on a 16,986 sq. ft. lot with direct backyard access to more than sixty acres of Cherry Canyon Park with miles of hiking and biking trails. It's rare to find an inviting home with such spectacular views. You must see it to believe it!" "Located in the coveted Greenridge Estates, this custom built house comes with all the amenities for luxury living: 5 bedrooms, 5 bathrooms, den and large bonus room in a 6,230 SF open floor plan. Double door entry opens into a grand two-story foyer with soaring ceilings, leading into a spacious and light-filled living room with floor to ceiling windows. The dining area opens into the grand living room, perfect for dinner parties. Family room with large bar conveniently leads directly into the beautiful backyard pool area. The gourmet chef's kitchen is complete with a subzero refrigerator, granite island and breakfast nook. Office den boasts beautiful custom wood built ins and coffered ceiling. Upstairs, there are four bedrooms with en-suite bathrooms. The generously sized master suite has a sitting area, large his and her walk-in closets, large master bathroom with separate shower and soaking tub, and private patio overlooking the backyard. The bonus room can be used as an extra bedroom, gym, or theatre/game room. The entertainer's backyard is complete with a stone patio, grassy area, built in bbq, spa and pool with grand waterfall. Home is located in the award-winning La Canada school district." "Located on one of La Canada Flintridge's most sought-after streets in the coveted Flintridge flats, this 1924 Traditional home is the perfect combination of architectural elegance and warmth. An inviting front entrance opens to a formal living room with fireplace where natural light pours through the windows for an intimate yet grand space. Across from the living room is the gorgeous formal dining room with wainscoting, built-in hutch and coffered ceiling. The clean kitchen with stainless steel appliances is conveniently located next to a delightful breakfast room and 3/4 bathroom. An expansive family room has a wall of sliding doors that extend to a covered balcony for the ultimate indoor/outdoor California living experience. The master suite is privately located on the main level featuring two bathrooms, multiple closets and access to a romantic patio escape. A classic staircase leads up to four charming bedrooms, one large full bathroom and laundry room. The enticing backyard offers an expansive grassy yard with play structure and gazebo, pool, spacious brick patio, multiple fruit trees and lush landscaping. A California basement, 2 car attached garage & circular driveway complete this home. Newer septic system installed. Award winning La Canada Schools." "This stylish Contemporary Hacienda sits on a quiet Flintridge wide, flat cul-de-sac with plenty of parking and room to play. Sweeping views of the mountains are enjoyed from most rooms. The flexible floor plan allows the home to function as a single story home perfect for all ages, but with the luxury of the lower level making home theater, guest apartment or studio space possible. Wide hallways lead to large rooms with high ceilings, walls of glass, and many French doors. Gracious master suite has sitting room, full bath, and huge closet. Sunny atrium opens to private patio with fountain. Family room flows to vacation-at-home yard featuring pool with waterfall, spa, built-in BBQ with serving area, seating and dining areas, and view. A bonus: Solar panels pay the owner's monthly bill." "Built in 1949 and located in the coveted Deodar District of La Canada Flintridge, this elegant 5-bedroom and 4-bathroom English Country Manor was thoughtfully re-imagined by noted architect Steven Dahl in 1998. Set on a knoll behind majestic Deodars, this expansive property enjoys a sense of openness with tree-top views. Authentic character abounds and includes a wood paneled library, 2-story sweeping staircase, hardwood floors, 4-fireplaces, 3-car garage, wine room, pool house, flat lawns, mature gardens, pool and spa." "Mid-Century Ranch style one level home and barns are located in Prime Flintridge on close to an acre of equestrian property with direct trail access to the extensive La Canada trail system! Situated at the end of the cul-de-sac with two street accesses, this oak studded property is truly spectacular and offers a park-like setting with lots of privacy. A 3 bedroom, 3 bath home of close to 2,400 square feet boasts a dramatic cathedral ceiling living room with decorative fireplace, cozy family room with dining area and fireplace, galley style kitchen, master suite with walk-in closet and den all on one level. There is a converted barn of close to 1,000 square feet with lots of space for the needs of one's choice. Four stall barn with in and out horse quarters has separate street and trail access, and there is a large turn out corral. Additional features include gated entrance, 2 car garage, solar panels, central air conditioning and forced air heating, relaxing patio area, and grassy yards. Surrounded by million dollar estates, this property is a special find!" "ESTATE HOME: On a knoll with great mountain views, designed for indoor-outdoor living. French doors open onto the spacious back yard. A few steps away, you will find the beautiful swimming pool / spa with rock waterfall and slide for a fun splash of entertainment. Outdoor kitchen invites you to an alfresco dining expereince. MAIN HOUSE and GUEST HOUSE offer a combined living space of 4423 SF (taped) and a lot size of over a half acre, 27,500 SF (assessor map). Beyond the guest house is over 5200 SF of vacant land, The main house features 3 bed, 3 ba, Formal LR with FP, Formal DR, Family room with FP adjoining updated kitchen with top of the line S/S appliances, SubZero(r) fridge, Granite Counters, a large center island, makes this chef's kitchen a wonderful experience for both cook and guests. The EXTRA-LARGE BONUS room with laundry, ample closets and upstairs bedroom, can be used as an enormous master bedroom, and upstairs office/Den. Oversized French doors open onto the back yard, that gives this room lots of light and ''feel good energy'' PLUS 1 bed 1 ba GUEST HOUSE overlooking pool.This property is ''TRUE CALIFORNIA LIVING AT IT'S BEST''." "This beautifully gated English Tudor style,two story home is situated in a cul-de-sac in a blue ribbon La Canada School district.Built in 1994,the home features 5bedrooms,a private office,hobby room,home theater(Rec.room),7bathrooms,and an attached 3car garage.The home also features a surround music system for both interior and exterior entertainment and an outdoor patio with a swimming pool.When entering the grand entry,one is met with a formal living room with a 12feet high ceiling.The living room is further accentuated with a fireplace and a view of the front yard.To the right of the living room is the dining room which features wainscoting and an elegant brass chandelier.Beyond the dining room is the family room and a spacious open kitchen with recessed lights and a granite center island.Also on the ground level is the master suite,which features a custom fireplace,walk-in closet,jacuzzi,wonderful wooden shutters,steam sauna and a French door that overlooks the canyon when opened.Opening the glass doors next to the living room is an office with grand built in oak cabinets/bookshelves.The spacious theater room/recreation room alongside a large home bar is located in the basement.Furthermore,the front of the house can be converted into a guest/pool room"